Short, densely packed needles and the double white bands on the underside are characteristic of Hemlock. There’s something about Eastern Hemlock that is reminiscent of the large California Coastal Redwoods: the broad, conical crown, the cinnamon brown furrowed bark, the graceful tiers of feathery branches. But our Eastern Hemlock lies in the Pine Family, not the Cypress family, and although substantial does not reach the giant proportion of the temperate climate Sequoias. Hemlock is sometimes confused with Balsam Fir (Abies balsamea) as the flat needles on both trees have two light-coloured bands underneath and are arranged in a single plane pointing forward on the twig. But there are many obvious differences between these trees: needle size, twigs, bark, and seed cones (see Trees Canadensis for a detailed comparison). When in doubt gently crush the needles between your fingers; an aromatic Christmas-tree fragrance indicates Balsam Fir. The presence of Hemlock signifies a climax forest where rotting nurse logs provide a preferred germination substrate. 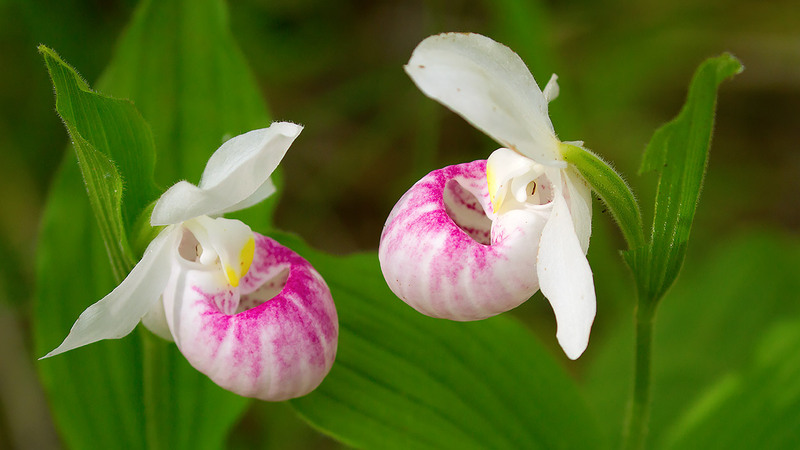 They are often found on rocky, cool, north-facing slopes where the tree can reach its roots down into reliable moisture. Waiting for windfall to open up a sunny glade, it grows slowly in the shade of other trees, meaning the age of a mature Hemlock is likely greater than its size would indicate. In Eastern Ontario, the largest reach 30 meters high and about one meter in diameter. Hemlock shares its forest with Yellow Birch (Betula alleghaniensis), Beech (Fagus grandifolia), Red Spruce (Picea rubens) and White Pine. 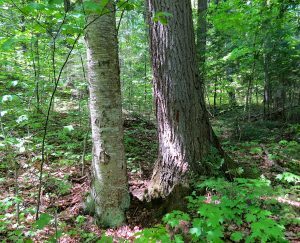 The small Hemlock and Yellow Birch seeds need clear ground or a nurse log to be successful as their roots cannot penetrate duff (the partly decayed organic matter on the forest floor) so they are often found in close, physical association. 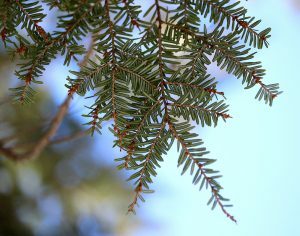 Finding a healthy regenerating forest of Hemlock is becoming more rare. The tree is under threat from climate change, deer and a foreign pest. Hot dry summers with extended drought stress the trees. Uncontrolled White-Tailed Deer populations decimate seedlings. Woolly Adelgid, an introduced Asian aphid-like insect that is moving into Ontario, kills the tree by feeding at the base of its needles, depriving it of nutrients. The Eastern Hemlock Project in iNaturalist is tracking the spread of Woolly Adelgid (Adelges tsugae), which is most easily observed from March through April as white, cottony egg sacks in the needles at the terminal end of branches. Hemlock’s preference for cool, moist, undisturbed interior forest conditions means it’s now more prevalent outside of towns and cities. On the Macnamara Trail look for Hemlock along the southern section of the loop with a specific stop at #13 near its eastern edge. For more Hemlock locations, photos, and observations of specific trees posted in iNaturalist, visit www.treescanadensis.ca. Better yet, visit a Hemlock grove and feel tranquility fall upon you.